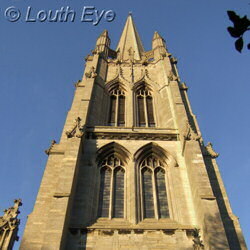 Louth, a Lincolnshire town, is famous for St James church, with its towering spire. It's also the birthplace of the astronaut Michael Foale. Highlights include the town's Georgian architecture and its unique, independent shops. 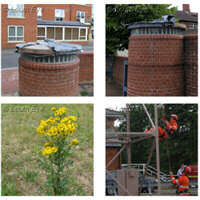 It also features the Meridian Leisure Centre and the Riverhead Theatre, home to the Louth Playgoers. The place has a somewhat twee image, but there's more to Louth than quaint markets and old-fashioned architecture. A fair amount of construction work and regeneration is going on. 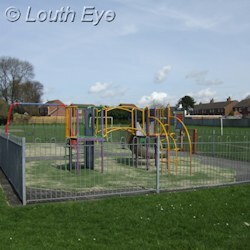 In places Louth is an extremely modern town. However, there are many people who work hard to preserve the town's unique character and its amenities, such as Hubbard's Hills. Amidst fury over plans to reduce bed numbers at Louth Hospital, a campaigner launches a petition to demonstrate the strength of local feelings. Test your knowledge of Louth and its people with this dynamic quiz. For years the skyline in Louth has been dominated by the spire of St. James and the enormous ABM building, also known as the Malt Kiln. Work started on demolishing the Malt Kiln in January of 2004 in order to make way for some flats, although this work ceased soon after, before being resumed in 2014 and completed in February 2015 in order to build an Aldi. St James, however, has stood for over half a millennium and is unlikely to be coming down any time soon. 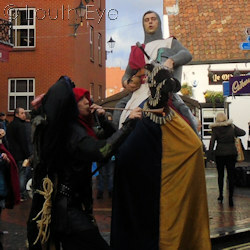 A knight and squire entertained crowds at the Christmas market. If you have any news about Louth you want to share, or if you want to comment on this website, please leave a message via the feedback form.